None of us are meant to do life alone. We are created for relationships, for family. 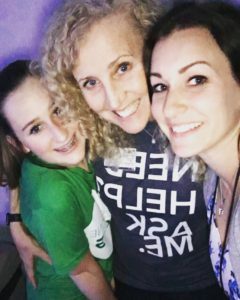 Coming from a painful, broken past, Krista never knew what a healthy family looked like. I grew up with 7 siblings in a very broken home. After my parent’s divorce and my mom left our family, fist fights and arguments were an everyday occurrence that I could never escape. I learned at a young age to be guarded and never let anyone get too close because I was afraid of abandonment. I never knew what it was like to have people invest in me or care about how I felt. I never shared much about myself with anyone and I always held all my feelings in until I would physically hurt myself because my anger would get the best of me. I ended up homeless and was consumed with anger. Even though I became a Christian in my late teenage years, I always felt like something was missing…a void that I didn’t know how to fill. I wanted the family that I never had, but I had no clue how to get it. I dated all the wrong men and was verbally and physically abused in those relationships. I knew that was not the way to get what I wanted, but I never had anyone in my life to help guide me. I ended up pregnant and alone with nothing to look forward to. My pregnancy was full of guilt and regret. Once I became a mother I knew that I wanted more for my daughter but I still just didn’t know what that was. I prayed for years that God would bring an answer to my need. 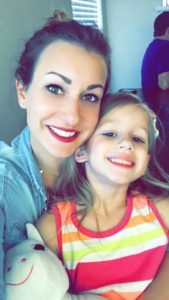 Last year, I broke down and became very depressed about being a single mom. After years of being alone, the struggle became too much to bear. I didn’t feel like I could tell anyone how I really felt and I just didn’t want to be a mom anymore. I felt inadequate and not good enough. I started to check out. I knew God was my answer but I definitely didn’t know what having a relationship with Him meant or even looked like. Honestly, at that point I had never had a successful relationship of any kind in my entire life. I am the kind of person that needs several huge clues before I really believe it’s meant for me. Well, last year, I was invited to Milestone by 3 different people within one week. I knew that was God’s way of telling me to take the chance even though I felt like this would be another church that I didn’t belong in. My first time at Milestone, I sat in the parking lot for a little bit before I worked up the courage to walk in. I remember being greeted by big smiling faces and at first I thought everyone was drinking too much coffee because it was just weird how happy they were. I heard Pastor Jeff speak and it was like he saw me in the crowd and was speaking to my heart. I knew that this was my forever home and I wanted to be planted. It’s been 10 months that I have been at Milestone and I have been so welcomed with open arms, that every piece of me wants to do the same for others. I have even seen a huge difference in my daughter. She loves our friends here and they love her so much in return. She doesn’t have her father, but men who are spiritual fathers in the church have stepped up to love her with no question. It fills my heart with joy that they do that for her. She has learned so much in the children’s ministry and her behavior has improved so much. We have learned to pray together and I have learned to pray for her future as a daughter of the King. It has been a huge change to actually want to be a better mother and grow in that area of my life and it’s all because I have people that guide me and love me enough to help me get there. I have Randi Johnson, who discipled me and invests in me as the mother I never had. The Johnsons have welcomed Kensley and I into their family without any hesitation. We have cried together and prayed together and I am so thankful the Lord brought us together. Everything is different when you feel people want you to be better and become this unstoppable vessel for the Lord. Since coming to Milestone I have learned so much about what it means to be a Christian and how to exemplify His great name. I have been able to laugh and pray with not an ounce of sorrow or pain. I have heard the Lord speak to me many times and I am so grateful that the resources and the people at Milestone have helped me get there. I serve in Elevate and Lift, I have my own high school girl small group, and I am going on my first mission trip to Nicaragua this summer. The Lord has filled me with so much joy I could burst. I just love the people so much and I love investing in the next generation. For the first time, in my entire life, I can genuinely say that I have a purpose and it is to serve the Lord and to do that with my spiritual family right by my side holding me accountable and lifting me if I ever fall. Krista, thank you for your transparency in sharing your story with us. We are so glad you’re a part of our spiritual family here at Milestone! This weekend, we honor and celebrate all mothers, both natural and spiritual, who’ve invested in the lives of those coming behind them. Moms, no matter your season, don’t underestimate your role in shaping the lives and destinies of your children. You make a significant impact in building the Kingdom of God. We hope you feel loved and valued. Have an incredible Mother’s Day! Very inspiring story ! I don’t know that we have met but I’m very proud of you and your decision to follow GOD! Way to go Krista. So proud of you and the mother you have become. The best is yet to be seen. Krista, I love you so much! It’s hard to believe you haven’t been at Milestone for years because you’ve grown so much!! Can’t wait to change Nicaragua together, and I love our sweet Kensley. You always say yes to what God asks you to do – I can’t wait to see what He has in store for your life. So proud of you, sister!!! Beautiful! Thank you for sharing your testimony! It’s so exciting game to hear how God is moving and changing lives. He is so good! Krista!!!! Crying reading this. God is so good! Love you so much! Come on Krista! You are a hero to Mary and I. We are so blessed and grateful to God for placing you here at Milestone. Michelle–we really hope you can make it to one of our services! We know it’s a big step, but just know that we’re here for you. Sometimes it can be scary to step out, but we’ll introduce you to Krista so you can hear more about her story from her! God has so much for you, Michelle, and He definitely wants to fill that part of your life that’s missing. Thanks for commenting!! Michelle, the first step is coming. It is definitely challenging with so many thoughts running through your head. But, if your story is like mine, the best thing that ever happened to me was taking that first step. I always attend the 11:15am service and I would love to meet you and help get you connected.